Happy Year of the Rooster! We hope that everyone had an amazing new year and enjoyed their time with family and friends. We had a great start to our year with another exclusive auction with Chengdu West. In total, over 300 domains were auctioned off at no reserve, bringing in over 750,000 RMB ($100,000+ USD) in total sales. Some of the domains sold include 96.xyz, 55.xyz, and FY.xyz, which sold for 67,000 RMB (~$9,661 USD), 61,000 RMB (~$8,796 USD), and 39,000 RMB (~$5,624 USD), respectively. The best deal of the auction was for 2.xyz, which sold for 202,000 RMB (~$29,128 USD). 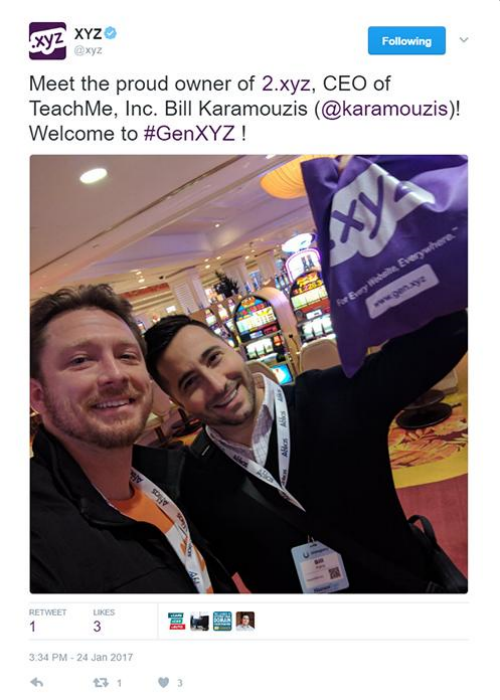 The winning bidder, Bill Karamouzis, is now the proud owner of one of only five single-number .xyz domains registered (1.xyz, 6.xyz, 8.xyz, and 9.xyz were previously sold in auctions). We even had the pleasure of meeting Bill at NamesCon in Las Vegas after the auction. Congratulations on your newest acquisition! We want to congratulate all of the winners who acquired .xyz domains in last month’s auction for unbeatable prices. We’d also like to thank everyone who participated. Even if you didn’t win the domain you wanted, there are still millions of short, memorable .xyz domains available to hand register. Search for 4-letter domains, Mandarin words and phrases, and even dropping names at www.gen.xyz/premiums or try out our CNOX tool: www.gen.xyz/cnox. This won’t be our last auction, so be sure to subscribe to our newsletter to get notified about our next event.